Here are some Short Stories for Kids to read, print, and share. These short stories are contemporary works written by experienced, established professional writers. Check back often, as new Short Stories for Kids are being added all the time. For classic short stories, visit any of the links shown below. I'm an unschooling mom, so I let my daughter make her own decisions. At age nine, Clare's decision was to enroll herself into public school, because she wanted to be like the other kids, and do what the other kids were doing. At age ten, her favorite activities were dancing, gardening, and Girls Incorporated. Dancing she took at our local dance studio. Gardening they would teach that summer at Girls Incorporated. Each girl would grow her own garden. It was to be Clare's last summer at Girls Inc., and she had many delightful daydreams about how it would go, who she would meet, what they would do, and the fun they'd have. She also looked forward to middle school in the fall, which she imagined was similar to a TV show called Ned's Declassified Middle School Survival Guide. Aside from that, Clare's general plan was to recline on the futon watching TV shows and playing video games all day, with all meals delivered to her side. “Mom! I'm hungry,” she called from the couch. All through fifth grade, Clare tried unsuccessfully to grow plants indoors, where they died for lack of sunlight. When she planted them outdoors, she forgot to water them. She also failed a school assignment meant to answer the question, “Do Larger Seeds Yield Larger Plants?” because she waited too long to plant the seeds, so we never found out. She used sunflower seeds for the experiment. So we planted two seeds of equal size in the back yard just for fun. 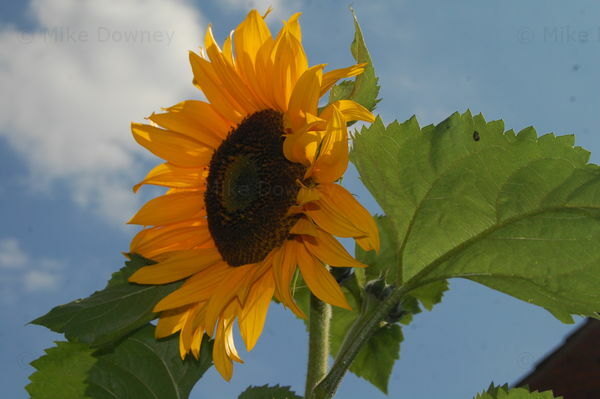 These were the kind of sunflowers that reach heights of up to six feet. Then came the end of elementary school. Forget moons and solstices. Any exuberant kid can tell you that the first day of summer is the last day of school. Clare showed up at our front door with her friend Margaret. “Okay,” said Clare, as they embarked on some unplanned adventure along a quiet, peaceful, tree-lined street in sweet home Alameda. A few minutes later I was in the attic sipping coffee, and looking forward to our trip to Eureka. I'd stayed up half the night before, creating a full color travel brochure for Clare while she slept. We'd see giant redwoods, which had captured Clare's interest when she saw two baby redwoods, small enough to be mistaken for weeds, growing on the grounds at Girls Inc. Then Clare's uncle Frank walked in. “Yes?” I called down from upstairs. My emotional reaction to this horrifying news was no emotional reaction at all. “Is she alive?” I asked politely. “Yes, but her leg may be broken. Just go on out to her,” said Frank. Next thing I knew I was running up the street, but my legs felt leaden, just like one of those nightmares I had as a kid. It was like I couldn't remember how to run. I couldn't seem to pull my legs along, as desperately as I wanted to reach my daughter. It seemed to take all day to run two short blocks, to the grassy green spot where my daughter was lying on her back, her leg bent most unnaturally, her head pressed against the ground, the blazing sun staring her in the face. What happened was that Clare and Margaret had seen an ice cream truck. Margaret had said, “I'll go get the money and you go wait by the truck.” Clare had bolted into the street without thinking, and was hit. I rode in the ambulance with Clare to Oakland Children's Research Hospital. The drive seemed like hours, but probably took ten minutes. The doctors treated my daughter with no questions asked. Both the bones in her lower leg were severed. I cringed at her agonizing screams, which lasted for hours after she emerged from surgery, where they put metal pins in her leg to hold the bones in place so they could heal. I occupied a cot next to her bed for five days. Hospital staff kept talking to me, but I kept forgetting what they wanted, or didn't understand the words they spoke. Straining to pay attention, I overheard doctors using the word catatonic, so I held my daughters hand and looked at her. She was looking right back at me and obviously speaking to me, even if I couldn't understand what she was saying, so I wondered what they meant by catatonic. Then I realized it was me they were talking about. Emotional shock, they said. I eventually got my daughter home, and helped her up the steps to our apartment. We occupied the top part of a house. She'd have to stay mainly indoors for a while. I put her on the futon in front of the TV, grateful to still have a daughter I could bring meals to while she watched her favorite shows and played video games. But Clare was inconsolable. She'd need crutches and a wheelchair. She would not be allowed to dance for six months. What's worse, she could not attend her last summer camp at Girls Inc. She would not get to grow the gorgeous green garden her mind had already sown. We were also not going to Eureka. Few girls have ever been more miserable than my daughter was throughout this long, lonely summer. For a while, Clare refused to go outside, dreading the strange looks she had already experienced a time or two. But at some point, she got an idea. “I wonder how my sunflowers are doing,” said Clare. “Let's go out in the yard and see!” I chirped. I entered through the back yard gate, with Frank pushing Clare in her wheelchair a short way behind me. I looked at the sunflowers we'd planted. It was too late to stop her from seeing what I saw. One of the sunflowers was about twelve inches tall and doing okay, but the other one had tried to grow up too fast, reached a height of about two feet, then buckled under the weight of its own head. It now lay face down in the dirt, its pretty head beginning to wither and wilt in the staring sun, the stem sharply bent and all but completely severed. It reminded me of Clare's broken leg. “Frank, take me back inside,” said Clare. As Frank wheeled her away, I examined that pathetic sunflower. There seemed no way to save it, but I couldn't stand to see it all bent and broken. I did what I could to stand it upright, splinting it on both sides with two sticks in the ground. The sticks were three feet high, so I rested the sunflower's head on one of them, and held the severed stem in place with a piece of twisted wire. No water had reached beyond the break in the stem. The sunflower was already turning a necrotic shade of brown. We spent the next few weeks inside. Clare was obviously depressed. Even her favorite video games bored her before too long. One morning I walked into the kitchen and looked out my east-facing kitchen window. All that is visible from this window is the beige stucco siding of the neighbor's house, and the top of a tall wood fence. I walked up to the window and looked down into the yard. The sunflowers were still there, both facing east to follow the sun. The smaller one had grown a bit. The larger one still stood upright, crucified as it was to the sticks in the ground. But someone must have pushed those sticks further into the ground, as the sunflower's head was now unsupported, and only had its own fragile stem to lean on. “Let's go outside and check the sunflowers,” I said to Clare. I fixed a snack for Clare, went to the living room, and checked on her cast. I forgot to go downstairs and tend the sunflowers. Some weeks later I walked to the kitchen window. I thought I must be hallucinating, because the larger sunflower seemed to have gotten nearer. Reluctantly, Clare hobbled her way to the kitchen window, leaned on her crutches, and looked down. “Let's go down and see!” I suggested. We made our way down that burdensome flight of cement steps beyond our front door, and around to the back yard. The larger sunflower was taller than I am, and I am almost six feet tall. It seemed to have reached its maximum height! The stem had now thickened, and the breaking point was now a healing scar. Even the smaller sunflower was four feet tall. We went back upstairs and, as always, the next thing happened, so we forgot about the sunflowers once again. Finally came the day when Clare had her pins removed, and her cumbersome, thigh-high cast replaced with a much lighter one that ended just below her knee. It was a major milestone in her recovery. On the morning we got home from that doctor's visit, Clare flopped down on the futon and grabbed the remote, as I walked into the kitchen to fix her a meal. I looked out the kitchen window and gasped. “Clare!! !” I squealed, like a giddy little girl. “What!! !” came Clare's annoyed reply. “Look out the kitchen window!! !” I insisted. Clare walked casually into the kitchen on her new cast, and there we both stood, gaping in stunned disbelief at the sight outside our sunny, east facing, second-story kitchen window. We both slowly approached the window, unable to quite believe what we were seeing - the face of a gigantic sunflower, about a basketball in diameter, staring right back at us through a 2nd story window! It should've been facing in an easterly direction like the other sunflower, but it had somehow twisted itself around to the west, away from the sun and toward we who are its friends. “Let's go check the sunflowers!” I said, but Clare had already bounded down the steps like her leg was never broken. “Careful!” I yelled out to her, wondering why I bother. I walked to the back yard, where Clare stood smiling broadly, her arm around her giant sunflower friend, which was now more than eleven feet tall! Her other arm embraced its twin sibling, about four-feet-six inches tall. “How did this one get so tall?” she asked. We still don't understand why that sunflower grew as tall as it did, or why it faced so willfully west, as if trying to see inside our kitchen window. Classic Short Stories And Poems Collection.